The two betting exchanges we recommend you signing up to are Betfair and Smarkets. So to recap what you’ve learned about matched betting so far: Every matched bet consists of two parts: a BACK bet and a LAY bet. The bookie is where you’ll put your back bet on and the betting exchange is where you’ll put your lay bet on. This is what makes a matched bet. And a matched bet is a bet that either incurs minimal loss as a qualifier or an actual profit from a free bet! 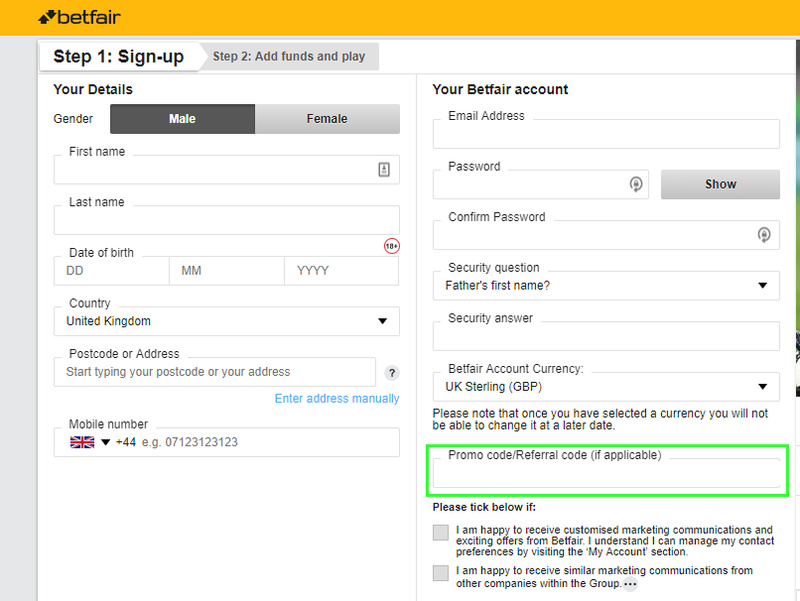 Below we’ll show you how to open accounts at Betfair. When you sign up to the exchanges, you also get some welcome offers, which you can take advantage of. Click here to be taken to the Smarkets Offer. We’ll show you how to use the £50 bonus from Smarkets in a different guide, but for now just sign up. Enter your details and fill out the form. In the promo code box, you should be able to see the offer code EXCCOF. If it’s not there, just type it in to get the £50 commission refund offer mentioned above. Just like that, you’re done and you’ve signed up to one of the main tools you’ll be using for matched betting. On Betfair when you deposit money, it goes into your ‘wallet’. If you win a bet, the money goes in here too. 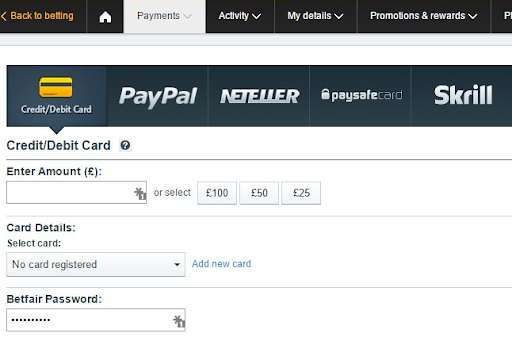 You can top up your wallet using your card or PayPal. The lowest amount you can deposit is £5. Note: There’s a small fee if you use credit card. So you’ve made it this far with me which is GREAT! 1. Search box: Super handy if you know exactly what you’re searching for in terms of a specific event. For example, if Manchester United were playing Chelsea you could simply type either of those teams into the search box to find all the events and markets you could bet on featuring just them. 3. Sport Highlights: Easy-to-scroll access to upcoming sports highlights. The final part to show you is the exchange were you can place bets on Betfair. This confusing-looking screen isn’t confusing at all once explained! On the left hand side you can see the outcomes that are selectable – so Rosenborg, Celtic and The Draw. These are ‘things’ you can select to bet on. Next, let’s focus on the blue section – Can you see that it’s called ‘Back’? That simply means if you were to place a bet on using any of the blue tiles you are placing a bet on that particular thing to happen. The numbers in the blue tile are simple to understand too. The big numbers are the odds for that selection to happen and the small monetary value underneath is the amount of money currently available to bet on that market. Let’s unpack that a bit shall we? Take Celtic as the example – you could BACK Celtic at odds of 1.65 and the maximum amount of money that is available to bet at these odds is £129. Simply put, you can bet any amount up to £129 for Celtic to win at these odds. Obviously, you don’t have to bet the maximum amount of £129 so let’s say you bet on Celtic to win the game and you stake a £10 BACK bet on it. If Celtic do win, your return would be £16.50 (stake x decimal odds = return). However, if Celtic do not win, you’d lose your £10 stake. On the right hand side, you’ll see that there is a section called Lay, which is the one in pink. Very important: LAYING is when you’re predicting that something is NOT going to happen. The numbers in the pink tile mean the same thing as the blue tile. The big numbers are the odds for that selection NOT to happen and the small monetary value underneath is the maximum you can lay on that selection. It’s much easier to understand with numbers. Let’s take The Draw selection for this example. Notice that you can lay the draw at odds of 4.4. Let’s suppose you lay the draw for £10. Remember with LAY betting you only win the bet if what you are laying on DOES NOT happen. If either Celtic or Rosenborg win then that means a Draw didn’t happen, so you would win your bet. Meaning you would win £10! Slightly more difficult to understand is what happens if you lose. In this example, if the game was a Draw, you would lose. But you wouldn’t just lose £10. Instead, the amount lost would be £34 (stake x (decimal odds-1) = liability). Automatically you may think that seems like a lot to lose on one bet. Potentially you could lose £34 if your bet loses, but only win £10 if you win. But odds are based on the likelihood of something happening or not. The higher the odds, the less likely. the less likely it is to happen the more likely you are to win your lay bet. So that’s Betfair in a nutshell. Hopefully this guide will have taken away the mystery of Betfair and what all those tiles mean. A simple way to think of it is the blue tiles you are betting on something to happen, and the pink tiles you are betting on something not to happen. It’s important you understand these concepts as we will use these in matched betting to unlock real profit without risking your actual money!